Dwell Baby is a totally sweet line for the modern nursery. Their latest offerings, these adorable plush animals and blocks, are made with Dwell's most popular bedding fabrics. Perfect for gifting the mom to be or for your own little bundle o' joy. You can get these from your friends over at Design Public. 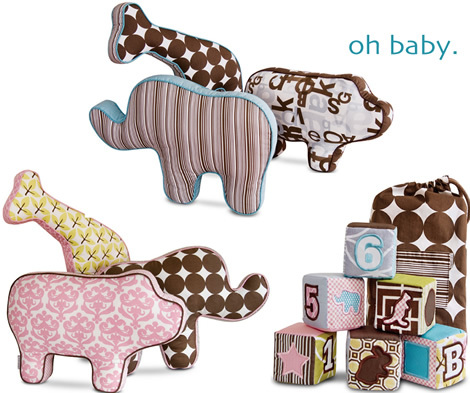 The blocks are $30 and the animal cushions are $105 for a set of 3. I wish I could justify lining these cute animals up on my bed (single girls go for it while you can! ), but my husband would drive off the end of the earth. By the way, I've added a bunch of kiddie links to decor8 last night, along with links to other cool sites, so scan both columns and look for the *. If there's a *, it's a new add!